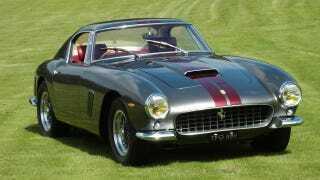 Britain's Driver and Vehicle Licensing Agency just set a new record by selling a a personalized plate for £518,000 ($813,622) to the owner of Talacrest, who will put it on the Ferrari 250 SWB formerly owned by Eric Clapton. Since the car's original 'TFO 599' plates sucked monkey balls, John Collins felt the need for '25 0', and while he was at it, he also purchased '250 L' for £130,320 ($204,693) to put on this 1964 Ferrari 250 GT Lusso, pushing the total amount paid to the DVLA to $1,018,315. Clapton's 1964 250 SWB is a right-hand drive car with a full competition factory engine and a 'GTO-stype' dashboard, and since barn find Lussos go for around 1,4-1,8 million dollars nowadays, I have no doubt that Mr. Collins will return a healthy profit selling it either with or without the fancy plates. The purchase price of '25 0' did not include any special time with Jody Davies, DVLA Personalised Registrations' Head of Events.